My Beloved Gold | Gold, Gold Gold!!!! A gold band may be the ultimate in effortless style, but it takes a lot of work to produce one. Forget any ’49er fantasies you may have of nuggets glittering in riverbeds: Most gold these days comes from large open-pit mines, where huge amounts of rock are churned up to extract tiny flecks of precious metal. A “rich” mine might contain just a few tenths of an ounce of gold per ton of ore; a “poor” one would have a few hundredths of an ounce per ton. The mining watchdog group Earthworks estimates that a standard 18-karat wedding band leaves behind 20 tons of ore and waste rock. Moving that much earth doesn’t just require a lot of energy. It can also lead to toxic mine drainage, probably the biggest environmental concern associated with gold-mining. When you dig up rock that’s been buried for a long time, air and moisture can set off chemical reactions that produce acids and leach toxic metals. If those substances — sulfuric acid, arsenic and copper, for example — run off into lakes, rivers and streams, they will pose serious risks for populations of fish and other aquatic organisms. Mine drainage is a problem for many kinds of operations, but it’s especially significant for gold extraction. For one thing, gold is often found in rock that contains a lot of acid-generating sulfides; for another, mining gold produces much more unwanted rock than does mining other minerals. New pollution control technologies can greatly reduce the emissions from gold roasters. For example, according to University of Nevada environmental science professor Glenn Miller, scrubbers have helped Nevada cut its mercury emissions from more than 20,000 pounds a year a decade ago to just about 4,000 pounds a year. Meanwhile, there’s hope that new treatment processes can also alleviate the serious mercury pollution issues related to small-scale gold-mining in the developing world. According to the EPA, these operations — which produce about one-fifth of the world’s gold — are currently the planet’s No. 1 source of mercury releases to the environment. Whether or not they roast the ore, big mining operations typically finish off the extraction process by dousing the ore in cyanide. Cyanide is extremely lethal, but as an environmental contaminant it’s not as problematic as mercury, since it degrades fairly quickly. (Mercury sticks around forever.) Some of the byproducts of that degradation process, such as nitrates, may contaminate groundwater, but a bigger issue is that the use of cyanide allows mining companies to go after very low-grade ore. That means they end up digging up more earth to produce the same amount of gold, which produces huge amounts of tailings, the material that’s left over once the ore has been processed. Gold tailing ponds and piles are chock-full of contaminants such as arsenic, antimony, residual cyanide and mercury, and so must be carefully managed to avoid generating runoff or coming into contact with wildlife. These tailings can stay toxic for centuries, so proper post-closure plans are crucial. Some experts argue that we shouldn’t have to mine new gold at all: We just need to let go all the shiny stuff we’re hoarding. In 2008, it was estimated that 157,000 tons of gold had been mined throughout history — and that individuals were sitting on a whopping 104,000 tons of it, in the form of bullion, coin and jewelry. So the best way for you to mitigate the impacts of gold-mining might be to make a personal pledge to keep gold in circulation. Try instituting a one-in, one-out policy for your jewelry box: Whenever you want to buy a piece of gold jewelry, take one you already have and sell it, or melt one down for re-fabrication. Do that, and you can glitter relatively guilt-free. How to Find Gold, Where to Get Gold, Information for Gold, The Ways To Make Money, Find Gold. Over eighty percent of all gold that is dug out of the ground ends up as jewelry. Industry boosters claim that it is an essential metal but in fact it is almost entirely cosmetic. Those few industrial purposes for which gold’s characteristics are required could be provided for through the recycling of gold coins and bars. This fact, that gold is non-essential, sets the tone of the tragedy that is the global gold rush, led by companies like Newmont and Freeport McMoRan. This current boom is on a scale unimagined in bygone days. For every ton of gold the U.S. industry produces today it also generates three million tons of waste rock. On a personal scale, an average pair of wedding bands could make a 6-foot wide, 6-foot deep, 10-foot long pile of tailings in the happy couple’s backyard. South Africa is the world’s leading producer; in 1997 it produced 494 tons of gold. For all the riches the industry represents in South Africa, every 1.86 tons of gold mined costs one life and 11.3 serious injuries through accidents. North America, particularly the western states of the United States, is still a substantial producer of gold. In one state alone, Nevada, the gold industry will leave three dozen huge open pits given their current operations. Each pit may be as much as three miles long, one mile wide and half a mile deep, and contain lakes that pose acid pollution problems. Brazil is the biggest single small-scale gold producer, with annual production of 80 tons. 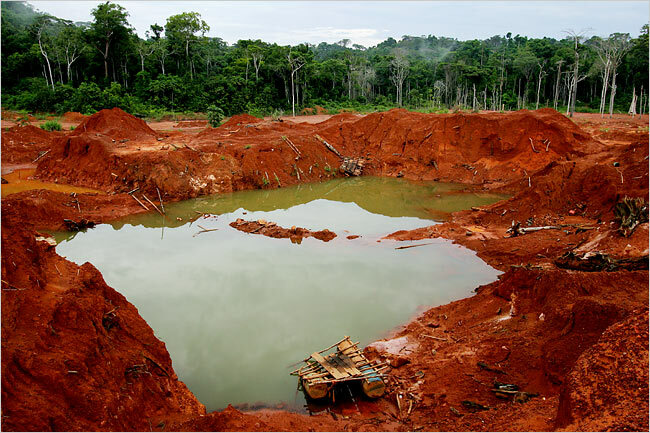 Some 500,000 gold miners work in the Amazon region alone extracting gold by dissolving ore in toxic mercury. Tests in several mining communities in Brazil found that more than 30% of miners examined had mercury levels above the World Health Organization’s tolerable limit. In Africa it is less well-known what the condition and impacts of small-scale miners are, although they produce approximately 20% of Africa’s gold. In the sub-Saharan region more than 1.5 million people work in the informal mining sector, while in Zimbabwe that figure is about 100,000. Here too the use of mercury is prevalent as a means to chemical extraction of the gold. All mining has historically caused major environmental problems. One of the biggest problems is the fact that metals like gold are found in sulphide ores which when exposed to air become acidic. This in turn becomes sulphuric acid when brought into contact with water, a common enough ocurrence in areas with underground water supplies, dissolving toxic heavy metals like arsenic, copper and iron. This phenomonen is known as “acid mine drainage” and is harmful to animal, bird and plant life. Old mines, in particular, where shafts were sunk deep into the water table without any thought of future problems, often end up contaminating groundwater permanently. Levels of copper as low as two parts of per million are considered lethal to humans while concentrations as low as five parts per billion can inhibit fish reproduction, which means that the fish population might dwindle over a period of years. Copper and sulfates concentrations exceeding one part per million can cause stomach and intestinal problems and kill animals like horses. Lead and mercury can kill humans and also cause stomach problems. 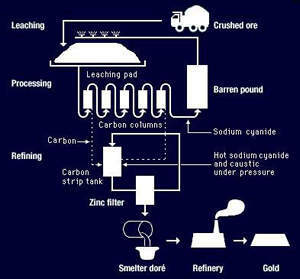 In the last three decades gold miners have compounded this toxic impact with a new and additional problem — a technology called cyanide leaching which involves pouring sodium cyanide solution over large piles of crushed rock (heap-leaching), abandoned dumps of pulverised ore that has once been sifted for gold (dump-leaching) or in large containers (vat-leaching) to extract the gold through simple chemical combination. The problem with this is the leftover cyanide, which can be re-used, but is more often stored in a pond behind a dam or even dumped directly into a local river. Invented in 1887 in Scotland, cyanide leaching was first used at Witwatersrand in South Africa, but it was perfected in the 1960s by the U.S. Bureau of Mines and first commercialized by Newmont Corporation in the United States. This technology can extract over 99% of gold from an ore allowing miners to obtain gold flakes too small for the eye to see. It also means that the miners can extract gold from the waste left behind from old operations which sometimes left as much as a third of the gold behind. Popular concern over this technique has focussed on the lethal impact of cyanide. A teaspoonful of two-percent solution of cyanide can kill a human adult. Cyanide blocks the absorption of oxygen by cells, causing the victim to effectively “suffocate.” Mining companies insist that cyanide breaks down when exposed to sunlight and oxygen which render it harmless. They also point to scientific studies that show that cyanide swallowed by fish will not “bio-accumulate,” which means it does not pose a risk to anyone who eats the fish. In practice cyanide solution that seeps into the ground will not break down because of the absence of sunlight. If the cyanide solution is very acidic, it could turn into cyanide gas, which is toxic to fish. On the other hand, if the solution is alkaline the cyanide does not break down. Cyanide-laced mining waste killed 10,000 trout at the Richmond mine in the Black Hills of South Dakota while 900 birds were killed when they drank water at an Echo Bay mine in Nevada in 1989 and 1990. And over 11,000 fish were killed along an 80-kilometre stretch of the Lynches River by a cyanide spill from the Brewer gold mine in South Carolina in 1990, although it’s true that the heavy metals that may have been present in the waste may have been potentially more dangerous that the cyanide. The gold mining industry looks set to spread like a plague, even though current production is higher than ever, because demand for the metal outstretched supply by 40% in 1996. Gold fever is quite literally sweeping the globe, with production jumping 50% since 1980 and expected to increase by a further 15% before the turn of the century. In 1995, 3, 642 tons of the stuff were mined globally. Most of the new gold is coming out of so-called developing countries including Argentina, Ghana, Guyana, Indonesia, Peru and Tanzania with less stringent ‘waste minimization’ requirements than the U.S. Old mining countries have also stepped up exploration and exploitation plans – Australia’s production grew nine fold since 1980 and will rise another 40% by 1999. In fact in 1995-96, over half of all exploration dollars in the entire mining industry was for gold, not for important minerals such as iron ore or bauxite. Disturbingly one out of five of these gold prospects was on indigenous territory or lands claimed by indigenous peoples. Within twenty years, with the decommissioning of many major existing mines, half of the gold produced is projected to come out of the lands of indigenous peoples. In 1849 the California Gold Rush resulted in a genocide of its native people while today Freeport McMoRan, operators of the world’s largest gold mine, have devastated five different indigenous groups on the western half of the island of New Guinea. The gold mining boom will set the stage for increased community dislocation, cultural erosion and environmental degradation in other communities. What do you think of when you hear the term “Hand of Faith?” Would you think of gold? That is what one of the largest gold nuggets in the world is called. Here is the story of the Hand of Faith. On September 26th, 1980, Kevin Hillier was using his metal detector near Kingower, Victoria, Australia. His metal detector signaled that something was buried in the ground below him. He dug 12 inches down and revealed the tip of this golden iceberg. A few minutes later and the entire nugget was removed from the earth. How long had it been sitting there just waiting for someone to come along and find it. This is currently the largest gold nugget ever found using a metal detector. I know what you guys might be thinking… To good to be true… But it’s a real story so if you live in the United States and you would like to take a look at this huge gold nugget yourself then consider yourself very very lucky. It is currently on display at Golden Nugget Las Vegas. This is a luxury hotel / casino in Vegas. The casino supposedly paid one million dollars for this massive nugget. I’m speechless… Just imagine that you love metal detecting and for a “Fluck” you find a gorgeous, yellow and big GOLD NUGGET, wouldn’t that be awesome??? 1- Tie a few feet of fishing line to some small lead weights and affix balloons to the line… Set it loose down the river and watch where the weights settle – that’s a good place to start your hunt for gold. 2- If you brush your teeth with a “Sonicare” battery operated toothbrush… Save the two magnets that drive the brush head when you replace it. These are very small but Super strong magnets… You can easily separate them from the brush head with a sideways twist. Use your new magnets to remove black sands from your gold. 3- In & around hills of shale rock, carry a canvas bucket & long handled, digging tool. Scoop out clay or soil trapped between pieces of shale, place scooped out clay or shale into bucket & carry pail to water source & pan the bucket. Shale rock cliffs & steep hillsides act as a natural sluice box & trap gold over the years as rain water wears down the hills. Submitted by B. Babson Duvall, WA. If Gold is all you think about, then you’re one of us, lol… Well on this blog we will talk about a lot of things related with GOLD, tips, techniques, and even tricks… Sounds exciting right? Before I say more I’m gonna introduce myself, my name is Sophie, and I’m a huge fanatic of that beautiful, gorgeous and yellow GOLD… I’d love to find a Hidden Treasure someday, who knows maybe I will, right?? ?